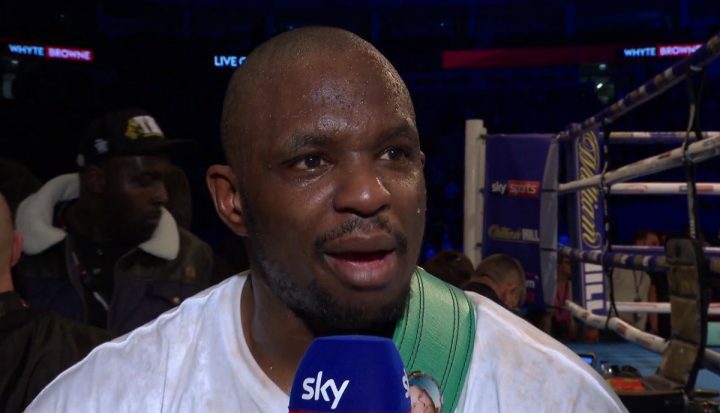 Fresh off his tough, off the canvas decision win over former WBO heavyweight champ Joseph Parker, Britain’s Dillian Whyte has massive plans. The once-beaten contender wants that big rematch with WBA/IBF/WBO ruler Anthony Joshua – AJ being the only man to have beaten “The Body Snatcher” – but Whyte says he needs a fight in December before tackling Joshua at Wembley in April. Then, Whyte told Sky Sports, he wants to fight Deontay Wilder and become the undisputed heavyweight king. First things first though, and Whyte says he needs a December fight to fully prepare himself for the big title fight, or fights, he says he is more than due. And Whyte has two fighters in his cross-hairs for December: Tyson Fury and Manuel Charr. Charr actually holds a version of the WBA heavyweight title (a belt he is set to defend against Fres Oquendo later this year), while Fury is of course a huge name. Whyte says he would fight either man before the end of the year. Whyte says that he and Fury sparred years ago and he said, intriguingly, how Fury “knows what happened.” If Whyte is correct and that big Wilder-Fury fight will not take place (Wilder, Fury and Frank Warren say it will happen), maybe he will get his chance at the lineal champ. Or is Fury holding no interest at all in fighting Whyte? It would, as Whyte says, be a big one, that’s for sure. Whyte is sure he would beat Fury, and then go in with AJ and then, after winning that, a massive fight with Wilder (who, of course, Eddie Hearn has tried to get Whyte a fight with a number of times). Whoever winds up facing who out of this bunch of heavyweights, one thing has to be agreed on, and that’s that the current heavyweight division is as exciting as it has been in quite some time. Can Whyte avenge his loss to Joshua? Can Whyte topple Fury? Or will Wilder and Fury actually rumble this year? Either way, it seems we are in store for some big and thrilling heavyweight match-ups over the coming months.